On 02-Mar-05, 1800 UTC I added 2,200uF capacitances in parallel with each of the two 470uF period determining capacitors in the astable multivibrator pattern generator. This caused the cycle time to increase to about 25 seconds. The slower pattern is more suitable for DX listening. Above are some pictures of this small modification (click thumbnails for large images). Left I found a small tin of components nearby in the attic and grabbed it as raw materials for the modification. Middle Here's what the beacon now looks like, after the mod. Right Closeup. The ugly just got even UGLIER. Below are the first reports screenshots. Apologies: SOME screenshots have been lost during a website rewrite. 03-Mar-06 08:00Z: First screenshot from Mike ZL4OL showing the new pattern. 03-Mar-06 09:00Z: Report from David VK6DI also showing the new pattern. 03-Mar-06 09:10Z: Mike ZL4OL sent this one soon after David's, an interesting comparison. 03-Mar-06 17:27Z: From Paolo I1DFS in JN54AC. I had to look outside my window to convince myself he wasn't outside in the street! 04-Mar-06 08:24Z: Mike ZL4OL copied five simultaneous stations: WB3ANQ , G6AVK and I are all intertwined at '085; below that DFCW from I1DFS and DL6JAN's zig-zag pattern. 04-Mar-06 12:22Z: Tj rand LA9BEA in JO29OG sent this very nice clear report from South West Norway. 04-Mar-06 16:46Z: Another from Eric ON4LP in JO11OE showing I1DFS, G0UPL, and G3GKI. 05-Mar-06 09:10Z: Nice first report from Andrea IW0HK in JN61FV. 06-Mar-06 12:20Z: More strong copy by Chris DL6JAN. 06-Mar-06 18:00Z: I like this one! I went to my attic for a few moments and adjusted the FSK pot, first to maximum shift, then none, then back to normal 3Hz. All of it watched on the other side of the world in Australia by David VK6DI . 06-Mar-06 18:19Z: Nice strong copy again in Rome, Italy by Andrea IW0HK. 07-Mar-06 17:42Z: Nice strong signal reception, as seen by Andrea IW0HK in Rome, Italy. 09-Mar-06 20:38Z: David VK6DI: "As the temperature falls in Hans' attic, we see that in VK! Note Hans' slow drift upwards in freq against DL6NL's more stable signal". (WB3ANQ 's sawtooth is above around '065, GPS disciplined). 09-Mar-06 20:39Z: Here's the same report from David VK6DI , viewed in the ARGO program instead of Spectran (above). 10-Mar-06 09:17Z: This LONGPATH reception report from David VK6DI is the strongest I've seen yet on longpath, distance is 25,500km / 16,000 miles! Larry WB3ANQ (his shortpath) just above me and Peter DL6NL below. 12-Mar-06 17:00Z: Strong copy from Andrea IW0HK in Rome, and just above me a new beacon transmission from Alex IOSKK also in Rome. 13-Mar-06 09:14Z: Even STRONGER longpath reception image from David VK6DI showing G0UPL (upper) and DL6NL (lower). 14-Mar-06 08:33Z: Nice one from Mike ZL4OL, who comments: "nice signals tonight. Hans and Larry are doing the tango around 10140.070 and Peter is waltzing along on .025". 14-Mar-06 17:16Z: First report from Alex IOSKK in Rome, Italy. Alex is also running a new beacon transmitter (see above). 14-Mar-06 18:22Z: This is an interesting one from Paolo I1DFS. He named it "hans_pwr_off.jpg". Sometimes the ionosphere really behaves as though someone switches the lights out!. 16-Mar-06 07:54Z: Report from Andrea IW0HK in Rome, also showing the new beacon transmission format from Alex IOSKK. 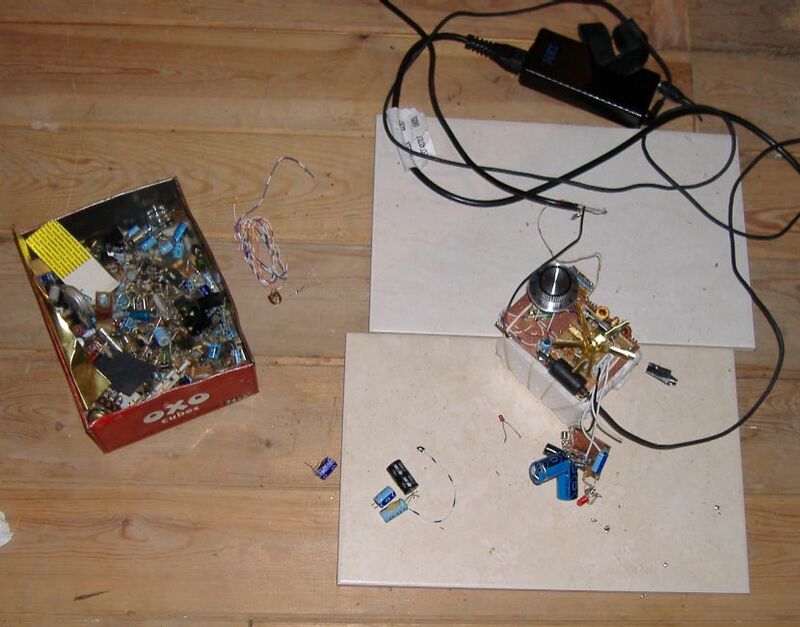 16-Mar-06 1230Z: First reception report of my beacon from Heinz OE5EEP in Austria. This screenshot shows WB3ANQ and G0UPL side-by-side. 18-Mar-06 12:56Z: The tiny beacon signal continues to POWER into the receiver of Chris DL6JAN. 23-Mar-06 05:02Z: Very good condx allowing this strong copy by Mike ZL4OL, also showing Larry WB3ANQ just below me. 30-Mar-06 18:55Z: First reception report from Giuliano I0CG in Rieti, 80km East of Rome (JN62KK). 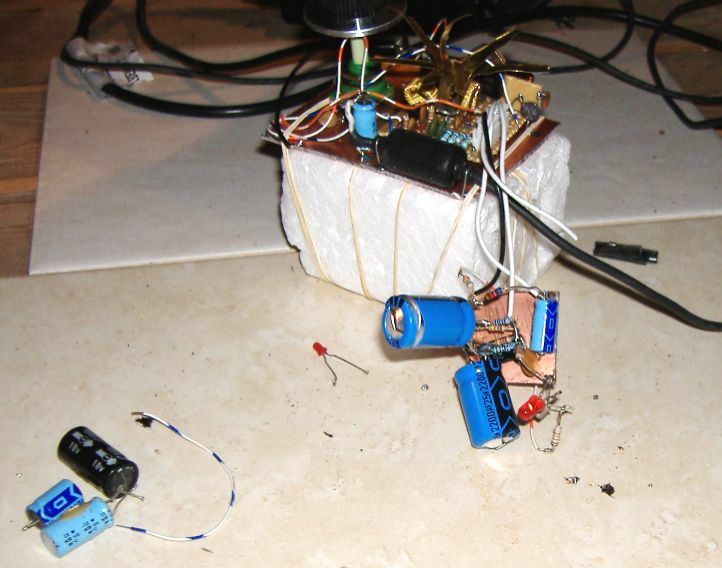 I was also the first QRSS beacon Giuliano copied! 31-Mar-06 07:49Z: First reception report from Valerio IK4GBU in Casalecchio di Reno, Italy. 10-Apr-06 13:00Z: First reception report from Peter PA1SDB in JO33KH, Appingedam, The Netherlands. Peter uses an Alinco DX70 and inverterr V antenna for 30m @ 5m above ground. 10-Apr-06 21:00Z: First reception report from Les G3VYZ in IO95FB. It's also the first report from a G- station. Interesting, because normally 30m reception would be difficult at this close distance. Les uses a 1m magnetic loop antenna and reports that the signal was only visible between 2051Z and 2102Z. 17-Apr-06 14:11Z: Nice image from Peter PA1SDB in JO33KH showing SIX signals on the 100Hz 30m QRSS subband! G0UPL is at the bottom. 21-Apr-06 12:17Z: First reception report from Alessandro IV3XYM in QTH Ronchi dei Legionari, JN65SU, using a Kenwood TS-2000, multiband dipole and homebrew TNC. Mine is the first beacon Alessandro has received! 21-Apr-06 19:25Z: First reception report from SWL Giuseppe Bini in Italy. 21-Apr-06 21:17Z: First reception report from SWL Giuseppe Bimbi in Italy. 22-Apr-06 10:30Z: First reception report from Alberto IK2JET. 23-Apr-06 10:30Z: First reception report from Vic G3GKI. It's very unusual for a 30m propagation opportunity to arise at such a short distance. 23-Apr-06 13:45Z: First reception report from SQL Andrea Lawendel in Milan, Italy. 24-Apr-06 17:44Z: First reception report from Claudio I2NDT in JN45TQ using an IC735 and 5/8'th vertical antenna for 27MHz!. 26-Apr-06 10:00Z: First reception report from Walter DJ2LF in JN59NO (Erlangen, Germany) using an IC729 and dipole antenna. 29-Apr-06 17:42Z: First reception report from Enrico IZ2KQP in Mese (SO), Italy near the Swiss border. Enrico uses an Icom718 and 10m random wire antenna out of the window. 29-Apr-06 12:02Z: First reception report from MYSELF G0UPL! DX was about 0.005km. The receiver is my newly completed simple homebrew direct conversion receiver. 30-Apr-06 11:57Z: First reception report from Micheal DK5NA in QTH JO42BH. 02-May-06: G0UPL scrutinsed under the magnifying glass by Chris DL6JAN! 04-May-06: 17:18Z: First reception report from Paolo IK1ZYW in JN35TC using IC728 and balcony antenna, with "open-air" audio connection between rcvr speaker and laptop computer microphone! 07-May-06: 08:18Z: First reception report from Staf ON6RR, difficult at the short distance between UK and Belgium. 07-May-06: 20:00Z: First reception report from Hartmut Wolff, in JO52HP. 08-May-06: 21:18Z: First reception report from Ale IW3SGT, in Trieste, JN65VP, using FT857 with TCXO and 300Hz filter, CB ground plane ant. 09-May-06: 19:50Z: First reception report from Matteo IZ2EEQ. 11-May-06: 12:55Z: First reception report from Johan SM6LKM, in Sweden - Johan reports: "G0UPL has been clearly audible for hours, strong enough for a normal CW QSO with "armchair copy"! 20-May-06: 11:30Z: Normally much too close for 30m reception, some very unusual condx permitted Des M0AYF to obtain this very strong first reception report. 23-May-06: 17:57Z: The wierd condx continued the next day too! Colin G6AVK is surely the closest station yet to copy my transmission, a mere 66km away. 23-May-06: 21:29Z: More strange condx! This time Bill G4KKI copied my signal in Manchester, UK IO83TM. 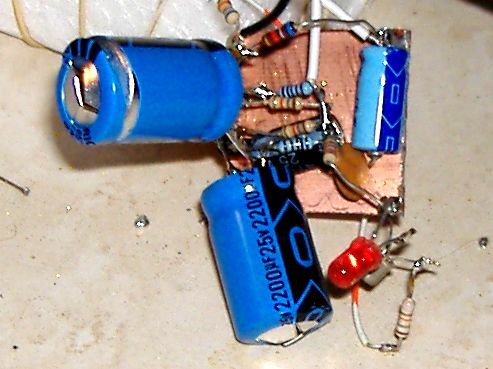 Bill uses a homebrew receiver just like mine! 07-Jun-06: 17:27Z: Very strong reception by Pierre ON5SL in JO10TT. 11-Jun-06: 18:30Z: Another strong reception report worthy of note from a local station, this is from Vic G3GKI. 15-Jun-06: 18:52Z: First report from Giuliano IN3KLQ in JN56RG. 29-Jun-06: 20:48Z: First report from Andy Smith G7IZU in Plymouth, UK (IO70WK). 09-Jul-06: 19:45Z: First report from John Knott 2E0KNJ in Wells, Somerset. Rx: IC756pro3. 21-Jul-06: 17:28Z: First report from Quirino Tirelli IZ8GFQ in Benevento, 70km from Naples, Italy (JN71JD). Rx: ICR75, 20m ant bal 9:1. 24-Jul-06: First report from Alberto di Bene I2PHD in Casirate, Italy (JN45SL). 25-Jul-06: First report from Todd Putman (son of Larry WB3ANQ) N3TFM in Kalamazoo, Michigan, USA (EN72FH). Note: reception using Icom 703 on the "wrong" sideband means the image is "upside down". 30-Aug-06: First report from Paul Stroud AA4XX nr Raleigh, NC, using Argonaut V and an 80m dipole ant up 30m.